What is 'Aimm'? A complete Airspace Reporting and Movement Management service for Aerodromes, for Landing Fee Billing, and provide the information needed for effective Risk Management, Compliance, Noise Complaints, and Funding applications. --- For many smaller airfields / airports 'Aimm-Lite' provides everything they need, at a fixed cost of $295 / month on a maintained lease with standard reports. The recording unit is plugged into the power and internet at the Airport. If a broadband internet connection is not available the system can use the mobile phone system for data transfer. It records all aircraft radio calls 24 / 7 / 365 with a time and date stamp, then analyses, archives, sorts and stores them long term. 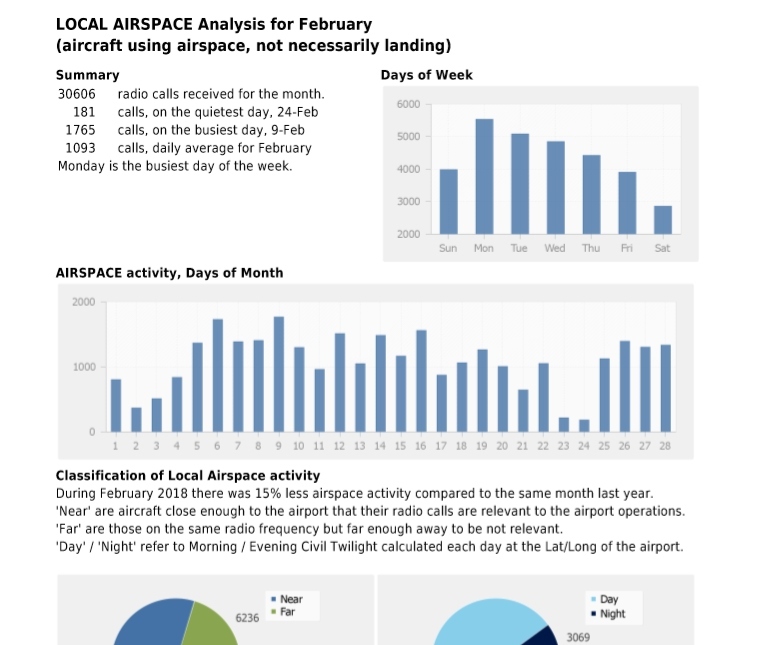 A report is sent within one week of the end of each month, showing the number of each type of movement (Takeoff, Touch and Go, Landing), types of aircraft (Plane, Helicopter etc), weights, runway in use, night / day airspace activity, day of week and other information, to the aerodrome for management and reporting purposes. To save unnecessary work and cost at the 'Lite' level of service, the radio calls are autonomously analysed by computer, rather than transcribed by human operators. The reports produced are detailed enough for non-Certificated aerodromes for the current (and known future) reporting requirements of CASA in Australia and CAA in NZ, so it provides an economical way of handling Risk Management, Aviation Authority, and Local Body Compliance reporting for those who do NOT need to bill landing fees. In event of a noise complaint, anyone authorised by the aerodrome managment can listen to radio calls for any period from three years ago to the last few minutes. This can be done from any device that has Internet access and can play a .wav file (most can). This allows quick incident investigation without the need for an after hours visit to the airport. With evolving Health & Safety requirements, it is no longer enough to 'Leave it to the Aero Club'. A landowner is expected to pro-actively manage risk to be able to show that they are taking 'all practicable steps' to safeguard staff, pilots, maintenance staff, and the public. At many airfields, a Flying School or Local Aircraft Operator does a good job of the day-to-day management but, in the event of an incident the land owner does need to be able to show that they were aware of the changing patterns of Air Traffic usage and have been reviewing these to confirm that the facility is being appropriately managed. If they do not have Airport Management expertise in-house, Aimm senior staff are available to discuss any points that raise concerns. This can take the form of a short discussion at no charge, or a full consultancy with written reports at reasonable industry rates. Aero Clubs / Local Aircraft Operators can provide AirCRAFT expertise but do not usually have AirPORT Management expertise. If requested by the aerodrome (and only then), Aimm operators will send copies of the relevant radio calls directly to an Incident Investigation Authority and certify their accuracy and completeness. --- Compliance / Planning Approval Information. To be able to quickly playback a group of radio calls to assist S&R, identifying what was said, by whom, and at exactly what time in an emergency. Most aerodromes want an occasional 'snapshot' of movements for a past or current period. Typically when they are due to review bulk fees for favoured local aircraft operators, so that they have definite facts on exactly who is doing what in order to make informed management decisions and negotiate from a position of strong knowledge. The Aimm central server monitors the on-site unit remotely to ensure that the system remains operational. --- This is a more powerful version to suit Airports that DO charge landing fees. It has all the functions above, plus it provides fully detailed reports every month showing the fine detail. It identifies for each movement: the time, date, the specific aircraft call sign or flight number, (and in the case of major airlines, can usually identify the actual aircraft that flew the sector on that occasion), aircraft weight, type of aircraft, aircraft operator with full name and address, type of movement (Takeoff / Landing / TnG), and runway or helipad approach in use. These reports are designed to meet Consent / Planning Approval / Compliance obligations, Airport Management requirements, Funding applications, and provide detailed movement reports for grant applications, special projects, and Master Plans. --- The on-site unit automatically encrypts the data and uploads to Aimm's secure internet server each night, and either Aimm staff or Airport staff download these and transcribe to enter the movements. Where the Airport chooses to have its own staff do the transcriptions, an efficient Transcription Utility program is proved that handles the work efficiently, and sends a timesheet detailing hours worked is sent to both the operator and the airport management each week. If the staffer falls behind then Aimm's operators automatically transcribe the oldest days to prevent a large backlog developing. When required to cover sickness / holidays, one of Aimm's transcription operators can usually take over the work on short notice. --- Management reports are emailed within one week of the end of each month to any number of recipients showing graphs and collated summaries of activity. --- Detailed reports in .CSV format (or in many Billing system's specific formats) are emailed within one week of the end of each month, with full details of each movement. This has the full names and addresses of the aircraft operators, and the price for each movement according to the aerodrome's pricing rules, and is ready for import into the aerodrome's billing system for the aerodrome to bill pilots for landing fees, usually with no further data entry. It can also be imported as a spreadsheet for further management analysis. --- Cost efficiency. Most Airports (or if Council owned, the Council itself) already have efficient billing systems. By sending the invoices direct to that (rather than having the billing done by a third-party) there are substantial savings in the cost of collection of landing fees. Often Aimm can provide a better service at around half the cost of other systems by making use of modern computer analysis and especially by eliminating the costs of paying someone else to do a job that the Airport is already set up to do for itself. Aimm's invoice file is available in all the import formats in common use by Airport billing systems. --- Whether the transcription is done by an Aimm Operator, or the Aerodrome's own Transcription Operator, neither of them have to make pricing decisions... when they enter the aircraft registration, Aimm looks up the price set by the Aerodrome management for its type, weight, or a specified rate (which can be $0) for particular aircraft, and adds the details to the CSV file billing data. --- ALL radio call recordings are available retrospectively, not just the revenue generating radio calls. Airport staff can listen to radio calls for any period from three years ago to the last few minutes at the aerodrome. As Aimm is a Cloud based system, this can be done from any device that has Internet access and can play a 'wav' file (most can). --- Provides all the services of Aimm-Plus (above), and is designed for Regional Airports and those with landing fees of more than $250,000 / year. Aimm-Regional uses dual recording units installed in different buildings on different power phases to provide full redundancy of movement capture. Either unit is able to provide all data, and the units are monitored daily to confirm that both are in full operation. pages where the important detail summarised in a format that is useful for management. 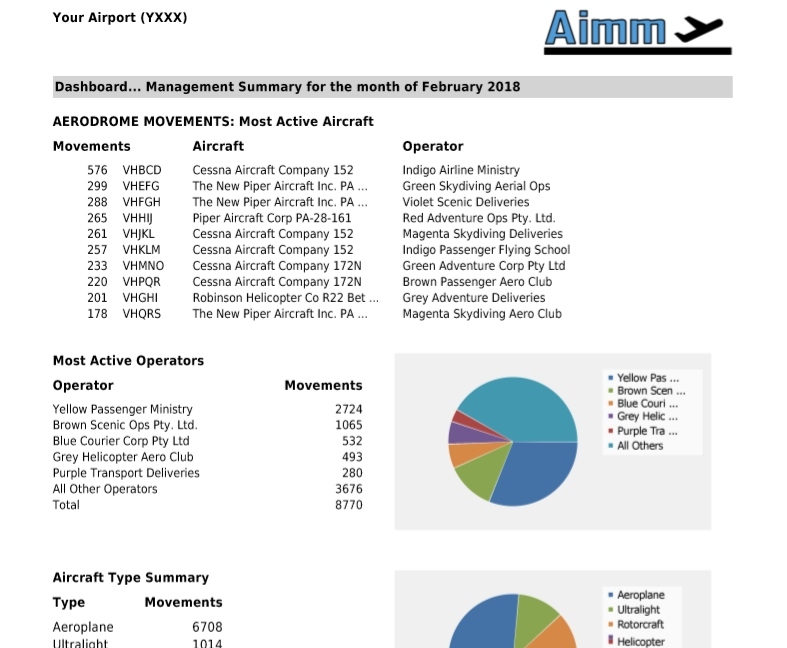 For all three systems including Aimm-Lite, the 'Dashboard' report condenses each month's activities into a concise view of the facts that Airport Management need to know... the 'who, what and when' of activity at the Airport. It is sent within a week of the end of each month to enable up-to-date and effective business decisions. In event of an incident, these reports provide written evidence that the Airfield / Airport land owner has been supervising the operations and has the information to take 'all practicable steps' to ensure the safety of the pilots, maintenance staff and public. For Aimm-Plus and Aimm-Regional, the 'Billing and Movement' report is also sent within a week, with fully priced and addressed invoices for direct import into the Airport's existing billing system, usually with no further data entry. By making use of the Airport's existing billing system rather than duplicating this itself, Aimm is considerably more cost efficient than most other methods of collecting landing fees. --- Aimm-Lite has a fixed monthly subscription. Aimm has no hidden fees or line item charges, so this is the only cost unless they want extra services such as a mobile data link, or Special reports / consultancy which are charged on a time and cost basis. --- Aimm-Plus and Aimm-Regional also have a fixed monthly subscription, and can choose whether to have their own staff carry out the radio call transcription, or have Aimm do this work in which case it is charged acording to the minutes of radio calls. These are the only charges unless there are extra services such as a mobile data link, or Special reports / consultancy which are charged on a time and cost basis. --- Either Aimm's Transcription Operators, or Transcription Operators employed by the Airport, can download the filtered radio calls from the Aimm Server onto any Windows computer, either at the airport or anywhere with Internet access, play them back and enter the movements. --- Aimm does all the rest... Airspace Activity and Movement Reporting, Risk Management reminders, Regulatory Authority reports to remain in compliance, and in the case of Aimm-Plus and Aimm-Regional produce a CSV file of priced and addressed invoicing data for import into the Airport's existing billing system so the aircraft operators can be charged landing fees. Aimm has robust system monitoring, data collection and retention methods, however the service is provided solely on the understanding that no liability for loss of landing fees or any other losses arising from loss or corruption of data will be accepted by Aimm. How is Aimm able to provide these services so cost-effectively? The Aimm developers have a long history in Data Analytics (extracting the meaning from raw computer data) and analysis of patterns in data. With the power now available on 'Cloud' based and Distributed systems, Aimm has the computer itself do much of the work and thus considerably reduce the human input required by the Transcription Operators. Aimm is able to provide these services cost effectively, typically at around half the cost of alternative methods and to a higher standard. By making use of the Airport's existing billing system wasteful duplication of billing facilities is avoided. Major differences of Aimm from other Movement Monitoring Systems and Methods? Aimm was deisgned to be a full Movement management system, which collects landing fees but also provides all the other movement-related information that an Airport manager requires... for compliance, complaints, regulatory obligations, Health-and-Safety, Risk Management, Funding applications. Collection of Landing Fees is very important, but it is not the only task an Airport Manager has to do, and Aimm provides a lot more... often at around half the cost of older systems for a much more comprehensive service. How to know if Aimm will meet my Airfield / Airport's needs? Phone one of Aimm's senior management to discuss the challenges and opportities that your Airport faces, and how other Airports have used Aimm to handle these. In many cases other Airports have faced the something similar, so we can usually advise on the solution, and results that were achieved. Aimm supplies self contained unit(s) on a maintained lease that is plugged into the power and internet at the airfield / airport. Your staff don't have to do anything else. The unit(s) monitor activity 24 / 7 / 365. Aimm staff will liase with IT and Accounting staff to sort out the 'nuts and bolts' of making it fit seamlessly into your existing systems. If a broadband landline is not available the system can use the mobile phone network for data transfer.